While paging through an old cookbook the other day, I came upon a printout of a recipe that I found in December 2006. 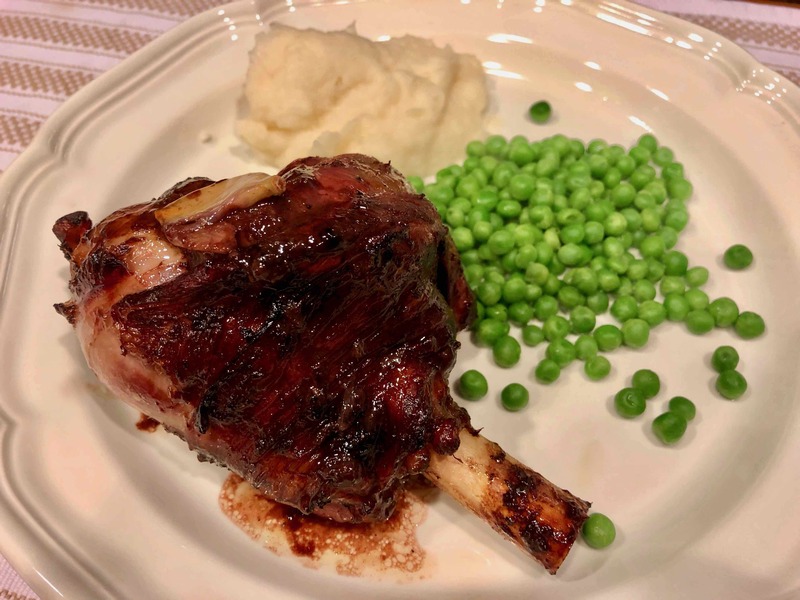 Titled, “Roast Lamb for One,” it was Nigella Lawson’s recipe for roasting a single lamb shank, a perfect meal for the bachelor that I was back then and why I had tucked it away. Yesterday morning, we went to our local butcher to purchase some pork shanks, which I had planned to braise with smoked paprika. Unfortunately, they only had two: one large, one small. That wouldn’t do. 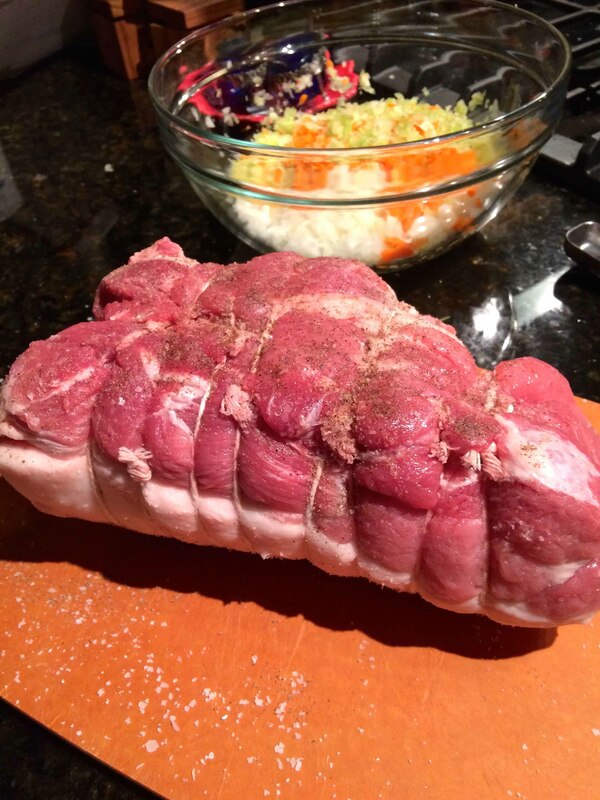 As I scanned the display, I espied a pork shoulder roast that prompted me to think of a Facebook post by cookbook author Michele Scicolone on braised pork, which called for, you guessed it, a pork shoulder roast. 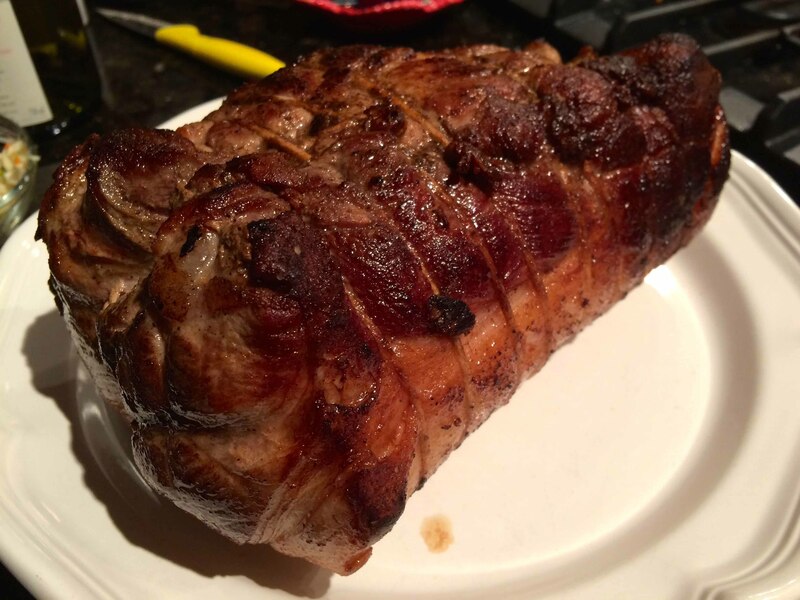 Even though we weren’t having dinner guests, I bought the almost four-point roast, and used my phone’s Facebook app to bring up Michele’s post for the recipe and shopping list. 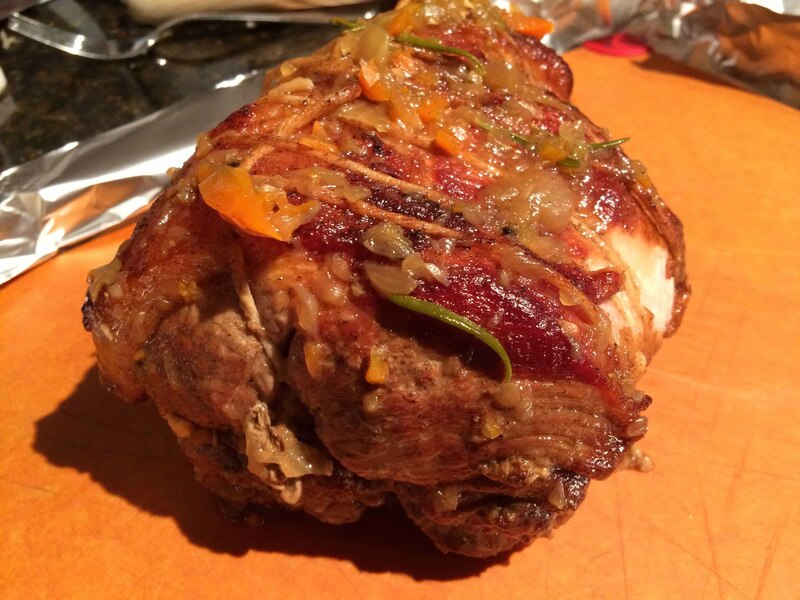 She claimed that “nothing is better than a pork shoulder especially when made in the classic Italian way, braised with aromatic vegetables, rosemary and wine.” Well after making it for dinner last night I have to agree—this was indeed the best pork roast I have ever made. Succulent, juicy, and aromatic, perfectly textured, it was absolutely delicious. I made a few variations, using one large sweet onion rather than the two medium onions called for, increasing the amount of wine and decreasing the amount of water, and adding a tad more fresh rosemary and a pinch of fennel pollen. The most difficult part of this recipe was waiting for this roast to finish cooking while being tantalized by its seductive aromas that wafted from the oven. We were salivating as it came out of the oven. As recommended by the author, I served the dish accompanied by white beans and chose a young Barbera d’Alba for our wine. 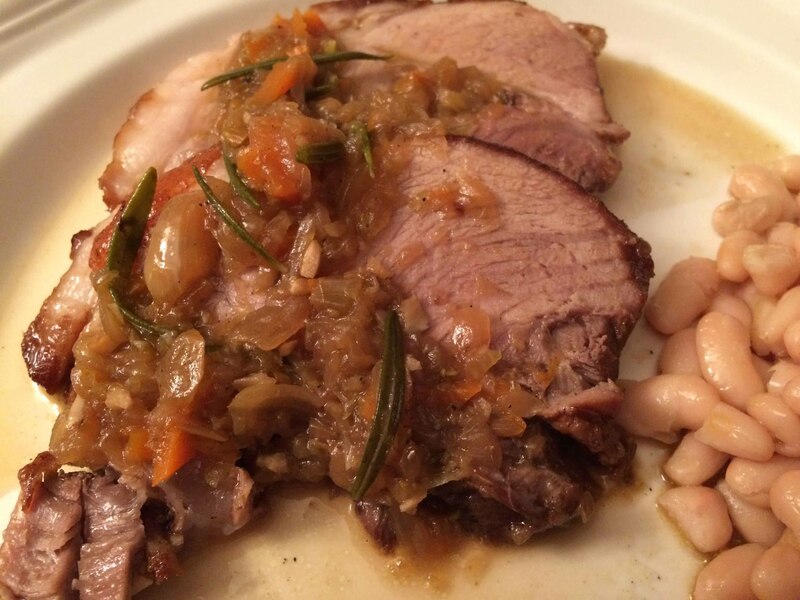 Here’s a link to Michele’s post: Brasato di Maile for a Festive Dinner Party. Note that a misprint in the recipe erroneously calls for a 14 pound roast as opposed to a 4 pound one. The roast is browned on all sides. It’s essential for flavor to take the time to brown the roast well. 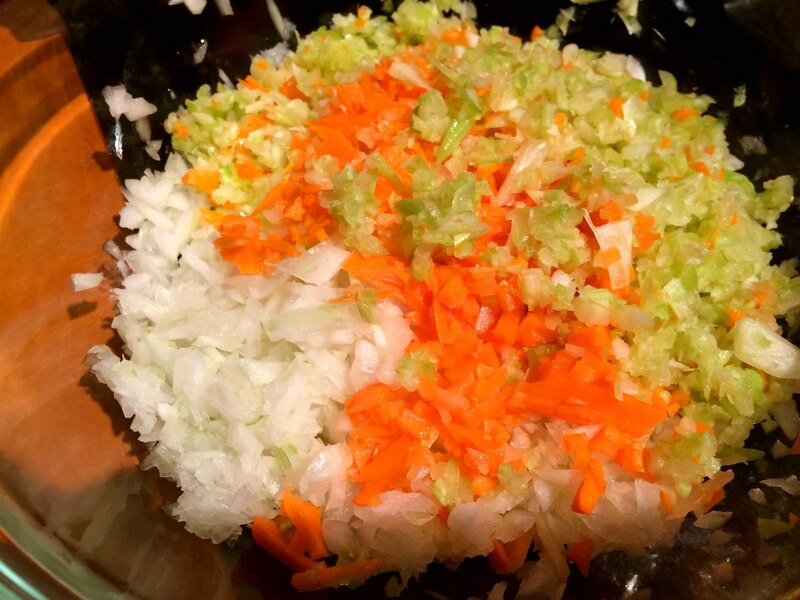 After browning the roast, I removed it from the pot and sautéed the vegetables, added the garlic, rosemary, fennel pollen, and the wine, and brought them to a simmer. I then returned the browned roast, along with its juices, to the pot. The roast cooks for about 2.5 hours, or until easily pierced by a fork.